Your dog’s breed and personality are two key components in determining whether they will be well-suited for protection training in Mooresville. Having a dog that has completed protection training is a great way to boost your confidence when you must leave your home and family or when you participate in your routine outdoor activities. You and your pet will enjoy a number of benefits during protection training, including increased confidence in their abilities and an improved bond with you as their owner. At Dogs By Andy K-9 Services, we offer a number of dog training services for pet owners in Mooresville, North Carolina, including protection training through our sister company, Paladin K9. When you come to us for more information about protection training, we first need to assess whether your dog is the right breed. Your dog’s breed and personality are two key components in determining whether they will be well-suited. If your dog lacks self confidence, is high anxiety, is afraid of noises, or is good at play, you may have a great family pet on your hands, but not an ideal candidate for protection training. This should not be a deterrent from all dog training, however, and we can recommend other dog training services that will be a great fit. At Dogs By Andy K-9 Services, we know there are many benefits to protection training, and we will work to ensure you are well-informed about the process before getting started. 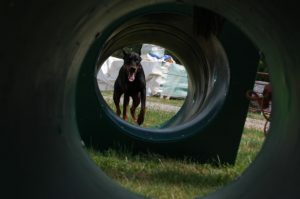 We have over 15 years of experience training dogs at our facility, and our expertise will give you confidence that your dog has the protection training you desire. If you have questions about protection training or one of our other dog training services, please contact us at Dogs By Andy K-9 Services for more information. We look forward to working with you and your pet! If you live and work in a high profile neighborhood or you work in an industry where you are seen regularly, you know how important it is to keep safety in mind at all times. At Dogs By Andy K-9 Services, we provide protection training for dogs in the Mooresville, Concord, Gastonia, and Charlotte, North Carolina area, including Myers Park, Weddington, Ballantyne, and SouthPark.